You are here: Home>Neighbourhoods>Old Town>Who was living on the High Street in Stevenage in 1911 ? Using Family History websites such as Ancestry and Find My Past it is possible to trace your ancestors and create your own family tree going back several centuries. However it is also possible to use census records on these two websites to find out who was living at a particular address when the census man came to note down the occupants, their ages, occupations and place of birth on census night.The Census is taken on a specific date every ten years.This article has been compiled from details of the 1911 census taken on Sunday 2nd April 1911. This brief study illustrates several challenges when working with census records. Some of the spellings of street names may be different from how we spell them now. Pubs, buildings and roads also change names, and are knocked down or suddenly appear and disappear between different census. House numbers can also change – if they are listed at all. Numbering of houses was a new thing at the start of the 20th century, and many rural villages and even small towns (such as Baldock) still did not have house numbers in 1911 – Stevenage streets were only numbered in 1910. Some of the occupations of those listed on the census are also unfamiliar – occupations and professions that were common then may be unheard of today and require further investigation. Confusion may also be caused by trying to read the handwritten entries from the original records (nineteenth century “copperplate” writing is hard to get used to), and while those writing the records (the “census enumerators”) would generally have been well educated, interviewees would often be unable to read and check what had been written – so you can find evidence of miss-heard names and variations in spelling. Peoples “christian” names also go in and out of fashion, and all this is reflected in the census records. Families were often much bigger in the past, and those who were wealthy,or had a profession often had servants living with them – almost invariably young unmarried women in their late teens or early 20s. Interestingly in the 1911 Census, for the first time women were not only asked how many children lived with them, but how many they had given birth to – and how many had survived childhood. Childhood mortality was a real concern 100 years ago. 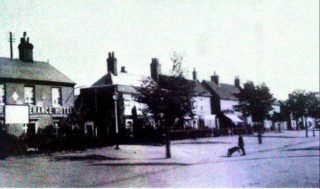 Using the Find My Past website, and doing a little further research on the internet and other local resources, it is possible to take a snapshot of who was in residence on the east (odd numbered) side of Stevenage High Street in 1911. The aim of this article is to show what is possible – similar research on the occupants of other Stevenage roads, or roads in any other town or village, going back as far as 1841 in some cases can be done using the “address search” on the Census records on Find My Past. So who was in residence on Stevenage High Street on 2nd April 1911? Headmaster (and widower) George Alfred Johnson who was born in Oxford in 1876. Karl Joseph Breuer, the modern languages master. The same age as Mr Hibbert, Karl was from Germany. It would be interesting to know what happened to him when war broke out little more than three years later. All are described as “workers” at this address, though only the headmaster was considered to be “at home” – the others present are either “servants” or “borders”. At No 3 The High Street we find Jonas Gazely – a 68 year-old carriage builder (no hint of any form of retirement from what must have been a physical and strenuous profession!) from Meppershall in Bedfordshire – with Elizabeth, his wife of 44 years, and his 29 year-old unmarried daughter (Thirza) and son – Frank – also single, aged 26, who is inheriting his father’s trade. Interestingly both children were born in Walkern – a search of previous censuses might show when they moved to Stevenage, and might also give more information about their five (presumably married) brothers and sisters. 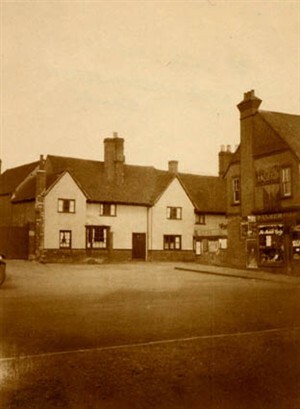 The family at No 7 – the Archbolds – remind us that some places, like Shephall – now swept up as part of Stevenage – were separate villages in 1911. That is where Frederick, a gardener, and his wife Mary are from – but their 17 year old daughter, Anne, was born in Stevenage. A closer investigation also reveals that Mary had had four children by 1911, but two had died in childhood – a 50% mortality record that would have been far from unusual 100 years ago. At No 9 35 year old “medical practitioner” Dr Peter Tarbet from Liverpool and his wife, Viola, lived a significantly more comfortable life than near neighbour Jonas Gazely. They also have live-in servants, Florence ( a cook) and Annie (a parlourmaid) – both only 19 – to ease their lives. Servants were not restricted to big houses and mansions! Next door at No 11 they also have a servant, even though it is the home of a widow, Elizabeth Edwards, and her two daughters – both in their thirties. One is a single music teacher ( a private teacher or teaching at a local school ?) but the second is intriguingly described as a “Companion” – and no marriage status is given. We can but guess what this might mean, but it may be that their domestic, 18 year-old Eleanor Chalkey (from Stevenage), may have had plenty to chat about to Florence and Annie next door! The town’s postmaster, Charles Ward, lived next door at No 13 – and he and his wife also have an 18 year-old live-in servant but, despite 17 years of marriage, no children. There are five public houses on this side of the High Street (as well as a The Temperence Hotel) – The Diamonds, The Old Castle, the Unicorn, the White Hart, and The Yorkshire Grey, which is the next entry at No 15. As well as the proprietor Willam Russell, this is also the home of Charles Walker and his family. Charles is a particularly noteworthy person as he is something very new – a chauffeur – a profession so new that the census enumerator has to add the note “non domestic” and clarify that this job means that Mr Walker drives a “motor car”. Both the Walkers and Russells have young families – five children aged under 5 live in the pub.Some of the younger childen may have been tied to table legs in busier times to keep them safe, a not uncommon practice. A couple of doors down at No 19, The Diamonds 56 year-old widow and mother of eight Priscilla Briars continued her husband’s business with the help three of her children, including 14 year-old Ruth who would have finished school two years before (the school leaving age in 1911 was 12), so helping in the pub would have been perfectly normal for someone of that age. The only major exception to this was next door at No 25 (now the Cromwell Hotel) where solicitor Cuthbert Corbould-Ellis’ wife, Eveline – uniquely on Stevenage High Street – is listed as having an occupation separate from that of her husband. She is an artist (the census enumerator has helpfully added “painter”). In fact, from other records, we know she painted minatures (they occasionally come up in auction – often with the alternative spelling of “Evelyn”) and that at least one of her daughters, Enid (who, at this time aged about 15, is not listed in the census) also became an artist and moved to Australia where a portrait of her mother, Eveline (and grandmother) is on display in the New South Wales Art Gallery. This was, in fact, a remarkable marriage in many ways – not least because after their marriage Cuthbert (Ellis) and Eveline (Corbould-Haywood) had combined their surnames. Corbould was, in fact, Eveline’s mother’s maiden name – Eveline was the fourth generation artist and very proud of the name – and on this weekend her widowed mother, Isabel, was visiting. The couple also had two servants, a cook and a housemaid. Next door, at No 27 the Temperance Hotel (which is now the Cromwell Hotel’s Business Centre) was having a quiet weekend (unlike other inns and hotels on the street offering a wider range of refreshment). Mr and Mrs Hood don’t seem to have any staying guests. It is very noticeable that families often had a wide range of ages – and an example of this can be found at No 31 where four of Caroline Brown’s five (surviving) children were still single, and living at home. They ranged from 24 year-old John (born in the third year of Caroline’s marriage) – who is learning his father’s cabinet making trade – to 6 year-old Samuel, born when Caroline was 47. Overall in 20 years up to the birth of Samuel Caroline had had seven children – two of whom had died as children. At No 35 there was a very different household, two 50 year-old spinster sisters, schoolmistresses Harriette and Kate Beaver. Next door at No 37 the residents of the Old Castle pubic house (now NatWest Bank) on census night in 1911 (Licencee George Grey, aged 35 from Stevenage) included two street musicians from London, Thomas Wimp – a 70 year old widower and “General Dealer” – and William Carpenter a “carman”. Carman is a common profession in the 1911 (and earlier) censuses – it was a person who had his owned a vehicle (horse-drawn) which he would use to collect and deliver goods – rather like today’s “white van man”. Some worked for specific companies, but William seems to have been a freelance. The census makes no mention of one other inhabitant of the Castle – but this is understandable as the census only records living people, and Henry Twigg (who resided the loft) had died nearly 200 years before. Nearby at No 43 was another profession that has largely disappeared. Henry Matthews was a news and music seller – sheet music, presumably. And he was not alone as a few doors down at No 69 was Harry Watson, a piano tuner and music seller. Also in this part of the the street there were two bootmakers (49 and 67), a draper (55), a hairdresser and tobacconist (57), a stationer (and newspaper reporter) (61), and a butcher (65), before we find the next pub – The Unicorn at No 79 where 32 year-old publican Harry Thody lives with his young family. There is then a caterer (and sweetshop) at 81 and a baker at 85 before we reach Annie Ashwood’s boarding house at No 91. Moving on to No 99 we find the final named pub on this side of the street, the White Hart, home of the well-travelled Harrisons. Originally from Jedborough Thomas and Hilda had been married for 13 years, but their 12 year old son Dudley had been born in Scotland, and their five year old daughter Aileen in Yokohama, Japan! There is a fruiterer at No 101 – Arther Cooper (33) and his wife, Ada (31) – who were entertaining a visitor, Frederick Stevens from London of that evening. Both had recently moved from Bedfordshire, taking over what had been John Bond’s greengrocery. Next door at No 103 lived Christopher Toll (58), a builder’s clerk, with his wife Adeline (61). Their two children had long since moved away. We now pass machinist John Bond and his family at No 105 – with his wife, son, three daughters, and mother. John hails from Chelmsford and his mother from Southwark, but his wife Louisa and all his children were born in Stevenage. Again you wonder at the mysterious attraction that drew so many people to this small town on the Great North Road as presumably it was here that John met Louisa. It is worth recording that six years later this would be one of three homes on the High Street to lose family members in the Great War. However, it was not one of John’s children – by 1917 they had moved away and the casualty would be Leonard Allen, son of Mary and James. He had recently married his wife, Constance, and moved from Walkern Road to the High Street. He was 21. At No 107 lived 47 year-old machinist Nathan Hodgson and his wife Lizzie – another Stevenage woman who had attracted a husband from far away, in this case Norton in Yorkshire. They had, however, only been married for nine years – since Nathan opened his business in the town, in fact. No 109 was the printing works of H F Matthews, with Henry Kingsland, the manager, living on site with his wife Ellen. Both are from the south west – Devon and Cornwall respectively – but their daughter Elizabeth (14 and a millener’s apprentice) and William (11) were born here. 63 year-old Edward Peters lived alone at No 111, a licensed pedlar he was making a living running a boot shop. Retired housekeeper 69 year-old Emma Wilkinson lived next door at No 113, also alone. Perhaps they kept each other company in the evenings? Nos 115-117 was the showroom of H S Bookers, cycle agent. No-one seems to have lived there but at No 119 we find Grocer Arthur Warren and wife Kate. No family, despite being in the 30s and married for eight years, but they do employ a servant, Emily Freeman (20), from Stevenage. No 121 was empty of census night, but other records suggest it was the home of a J Burr. Arthur’s expertise in the use of gas equipment may have been why he was selected to serve in a special unit of the Royal Engineers. He was serving in “Z” company of the Royal Engineers which was a unit specialising in the use of Gas & Flame Projectors. On the 3rd April 1917 the company were proceeding along the Lille Road near Arras when they were heavily shelled by German artillery, killing Arthur Chamberlain and his Sergeant and seriously wounding their officer, who died three days later from his injuries at a Casualty Clearing Station near Aubigny. Arthur is buried in the St.Nicholas British Cemetery, Pas De Calais, France. He was 25. Nos 127-129 was a butchers, F Steers, but above the shop lived the Palmers – Charles (a bricklayer), Laura, their daughter and four sons. Two other older children had left home, and three others had not survived infancy. The butcher himself, John Frederick Steers, actually lived next door at No 131 – Trinity Farm – with his wife Florence and stepson 10 year-old Thomas. We now reach No 133 – the “Coach and Horses” with Albert Haddrell is listed as a publican. No 135 is divided into two homes – and has a third “cottage in the rear” where the Thustains live, a family that had originally settled in Devon where father George was from, but appear to have recently returned to the home of his wife, Jane. Finally at No 137 we find the family of Thomas Gray, a 72 year-old woodman and his wife and mother of seven Louisa, along with daughter Annie, 31, who is yet another servant – though in this case it seems she lives at home. All of this information – and more – can be found in Hertfordshire’s public libraries, which can provide free access to Find My Past and Ancestry to library members who want to know more about who was living in Stevenage – or anywhere else – between 1841 and 1911.The author would also like to thank colleagues at Stevenage Museum. This page was added on 06/09/2012. I have a memory about the old town pond at the bottom of walkern road, but it was filled in many years before i was born. I can recall leaning over the wall as a kid to look in it and the smell of pond water, in my memory it had no entrance to it on the corner unlike the photos, very strange!! Karl Joseph Breuer was interned on the Isle of Man for 4 years during the war. His mother who also lived in England was sent back to Germany, hence he returned to Germany after the war. His daughter married an English service man at the end of the second world war and has lived in country ever since. What a fascinating and wonderfully informative article. Thank you. It really brings this place and period to life.